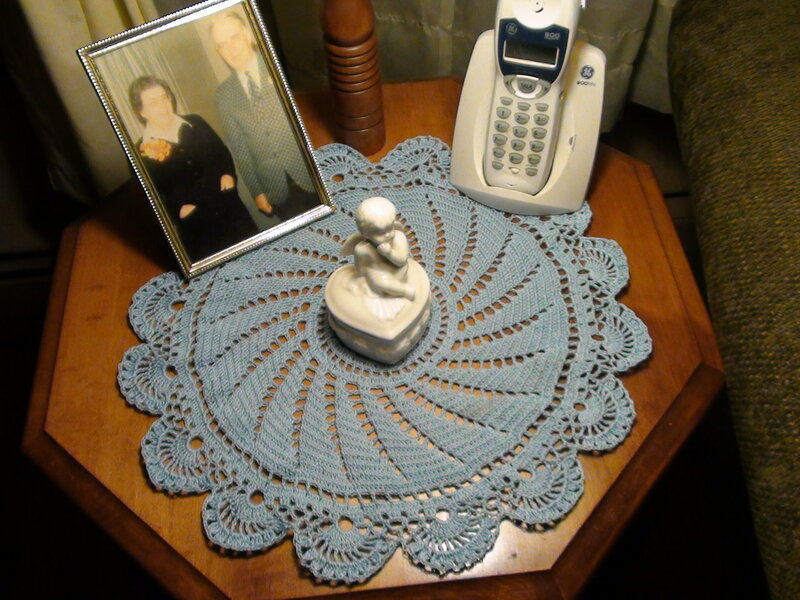 This is a close up of the texture of the "Fundamental Grace" Doily! It is amazing how using the same stitch in different ways can create such beautiful art! I am so amazed with it! This is a reading shawl that I made for my mother for Christmas. 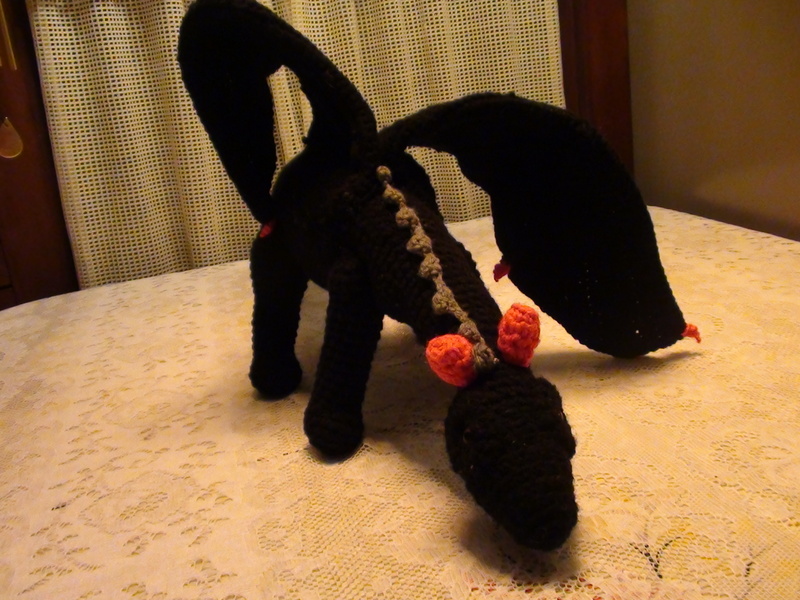 Made this Dragon for my oldest grandson, Anthony. He was very pleased with it. Picked the colors himself and watched me as I made. I is now learning how to crochet himself which I think is great and he is really enjoying it a lot. He likes to get creative and is even trying to design his own patterns. My youngest grandson has asked for one too and wants his to be and light green with darker green scales. I am making one right now for a little friend of theirs, whose birthday will be this coming weekend. Her's is going to be pink! It is really coming out great. Will get pics soon. As of today the new floor was started and it going to be beautiful! We are putting in a white oak wood flooring (matches the rest of the house) but will have strips of Purple Heart hardwood down where the floor joins the hallway and dining room plus it will be used in the back doorway area to "frame it" as if it were a rug. Very excited to see the finished product! My new hickory cabinets were supposed to have been delivered to our designer today (haven't heard if they were or not) and we will have those brought here on Monday (if every thing goes right). Still wavering on the sink - granite or stainless steel. I love that I can get the granite to match my counter top but I also found a really nice one basin stainless steel sink a week ago. The only draw back to the stainless steel one is that it comes with a faucet and soap dispenser (which is awesome) but not the one I would like to have. Decisions, decisions. This is the first and only time that I will probably doing this so I want to do it right. Any ways, everything looks like it will be done the second week of February probably. So I will be able to have everything put away where I want and have time using the kitchen for awhile before my parents come out the end of March and I have a large family gathering on the 1st of April. Looking forward to this a lot. Maggie Weldon of maggiescrochet.com starting the Tuesday night Crochet a Longs so that those who would enjoy sharing the love of crocheting, the stories they would enjoy to tell and as well as getting answers to questions had a place to do so. It has grown in size and we have friends from all over the world who join us, if not during the CAL then in their postings of their work to add to the weekly albums for others to vote on. The ladies have shared some of the most beautiful work and stories. 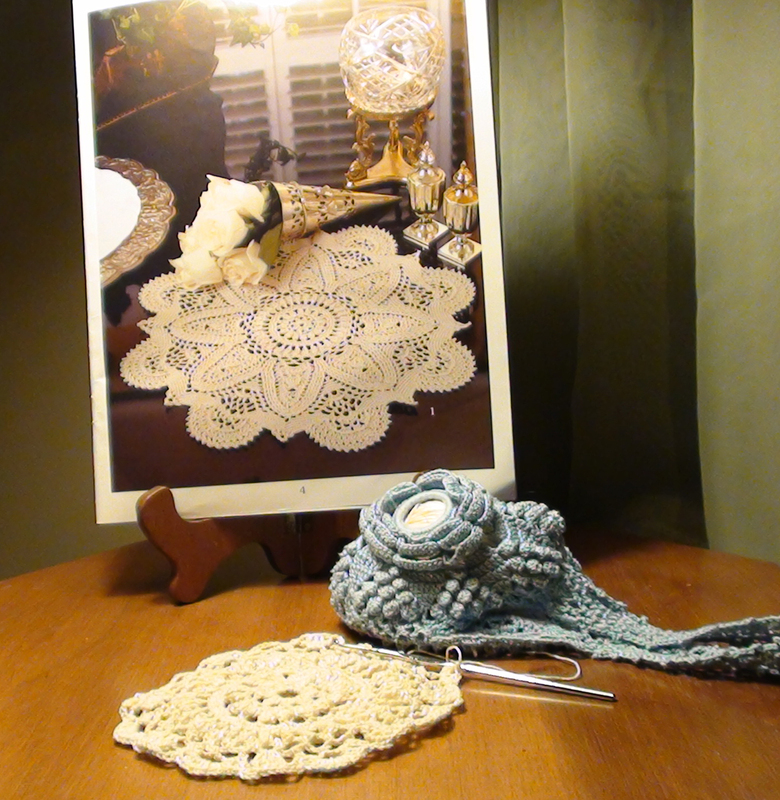 Along with hosting this Facebook site Maggie Weldon maintains her own website, which happens to be "The Largest All-Crochet Site" online. 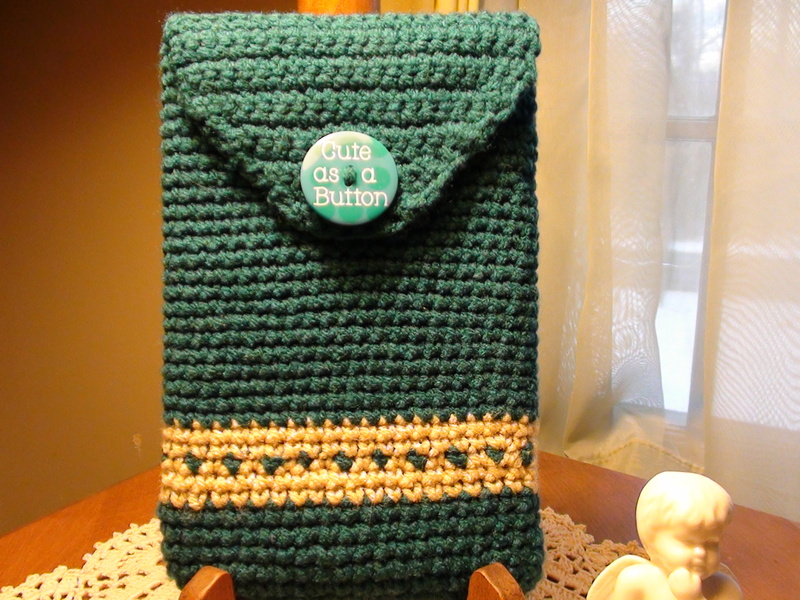 She creates her own designs and has several books full of beautiful patterns. 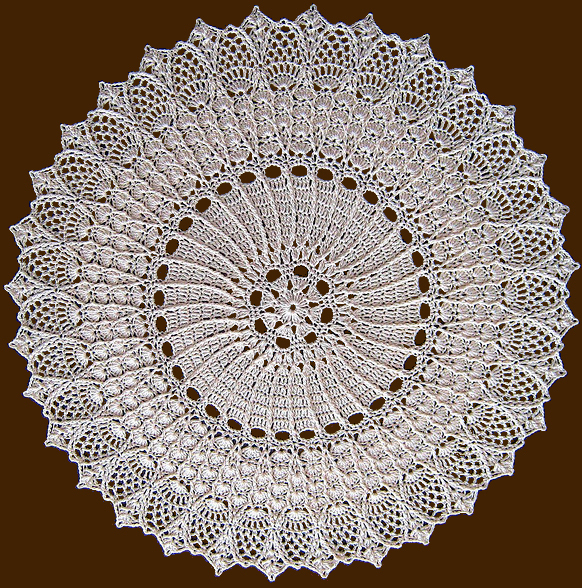 There are many, many free patterns available on this stie as well. You can as see what contest may be going on this month and come and join in. I have felf very honored for the compliment. So thank you Maggie and including me as you have and for all your encouragement that you have shown me. I received a very nice Nook Color Tablet for Christmas from my family this year and have been looking at the covers available for it but did not find anything that I really liked. So I set out looking for patterns for sewing or crocheting that I could make myself. 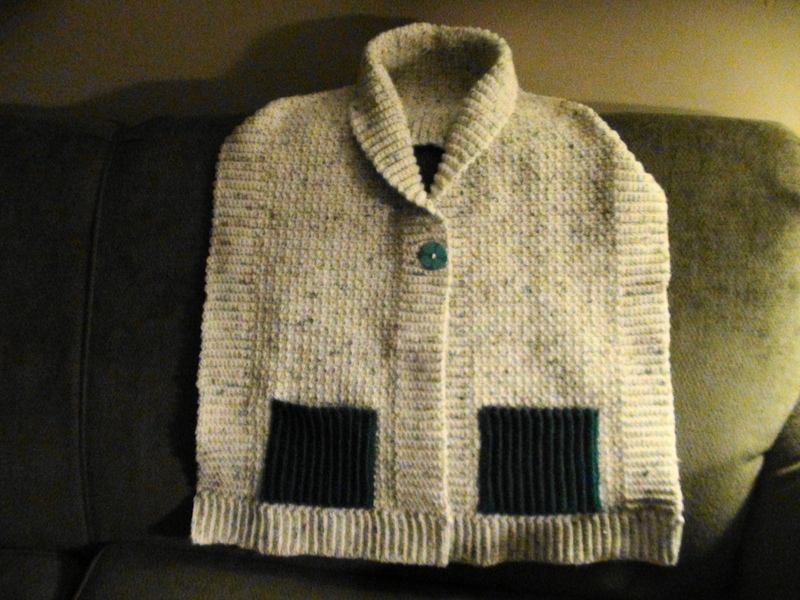 There are so many nice ones out there and while I was looking for one I started crocheting and the next thing I knew, I had this finished. It is nice and snug. 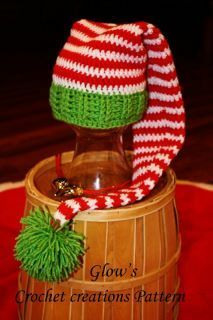 I think I will try making some more so that I can have different ones for the many moods that I have from time to time! :-) I am working on doing a book type of cover next. Will keep you up to date on that. 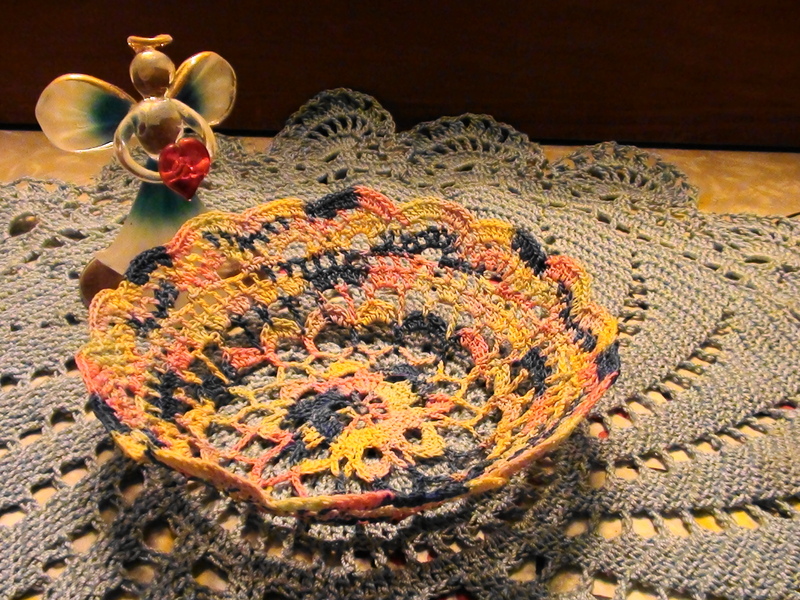 Have been notified that an entry I submitted was accepted on Antique Crochet Patterns site. This was a pattern that I was attracted to in 2010 and throught that it would be fun to make. I have been interested in the reproductions of vintaged patterns for some time so I gave it a go. It was so worth it! I have enjoyed the thread holder so much. It is really great to use. The thread rolls easily through the either hole and there is hardly any weight on your wrist while you are working with it. You are not chasing your thread ball around the place while you are working. 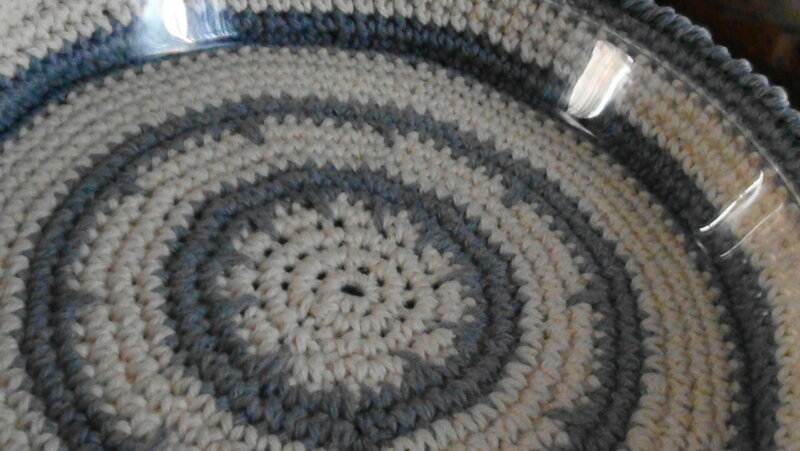 It is just are really beautiful accessory to my crocheting. 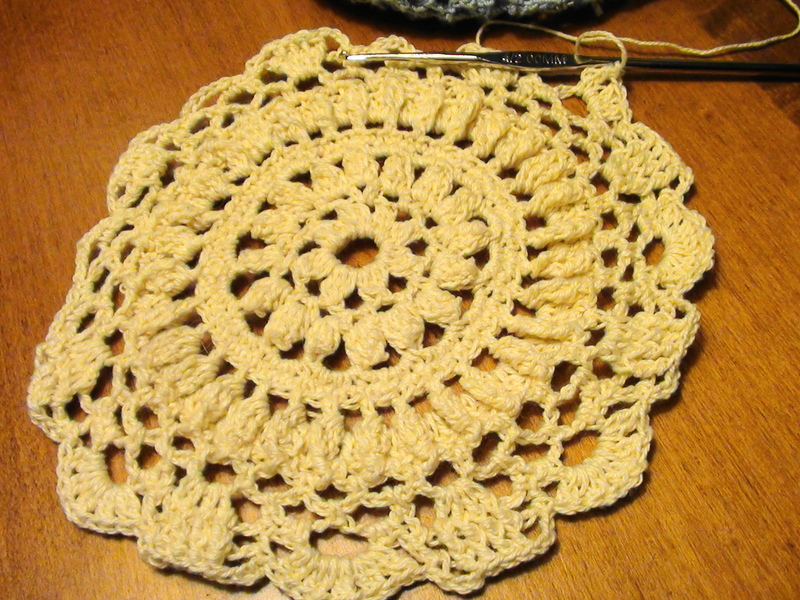 I am working on more vintage projects and look forward to sharing with my crocheting family! 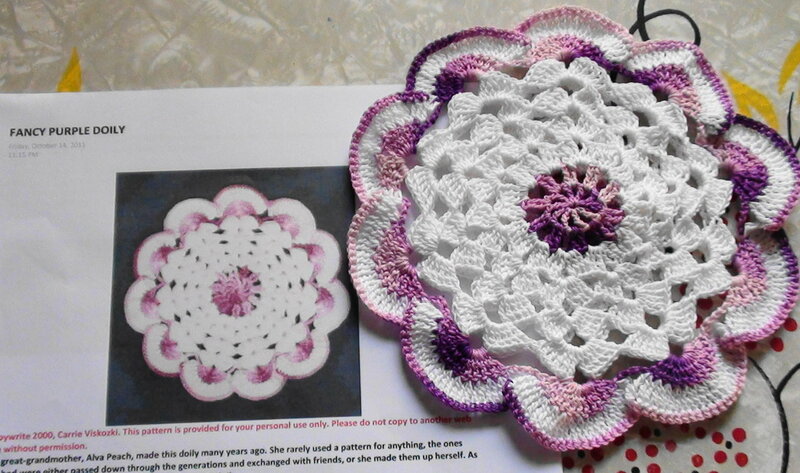 This is from a new pattern book that I recently purchased and I am looking forward to doing the other doilies in it as well. Had most of the kids home! Tim came home on Wednesday, so everyone was here the rest of the week and have had a great time with everyone. I have really missed having them all around. Billy and Becca are doing well. She is starting to really show now. She is due in May with their first little girl, Mollie. They brought their german shepherd, Brownie, with them but she has been staying with Becca's father most of the time. She is really a beautiful dog. Danielle's boys have been having a great time with both Billy and Tim! They have really missed both of them and have been catching up on the lost time as much as possible. Danielle went to see her baby doctor today and was told that the baby is either big or really long! Big she is healthy and in place now. I think she has nine weeks to go now and has been really misable for the past few weeks. I hope they go by quickly for her. We are working on the kitchen. Demo is going slowly right now but is suppose to pick up again tomorrow. Talked to Doug Kilgore this evening and made the final plans for the floor (it is going to look so nice). Cabinets should be coming in in a few weeks so we need to really get the rest of the kitchen done and ready for them. But I don't want to push Mike. I know he will do it when he can (or wants to). I have been on the go so much and it is starting to takes it toll. I hurt a lot but dealing with the pain the best that I can. Some days I just want to sleep right through it if I could. 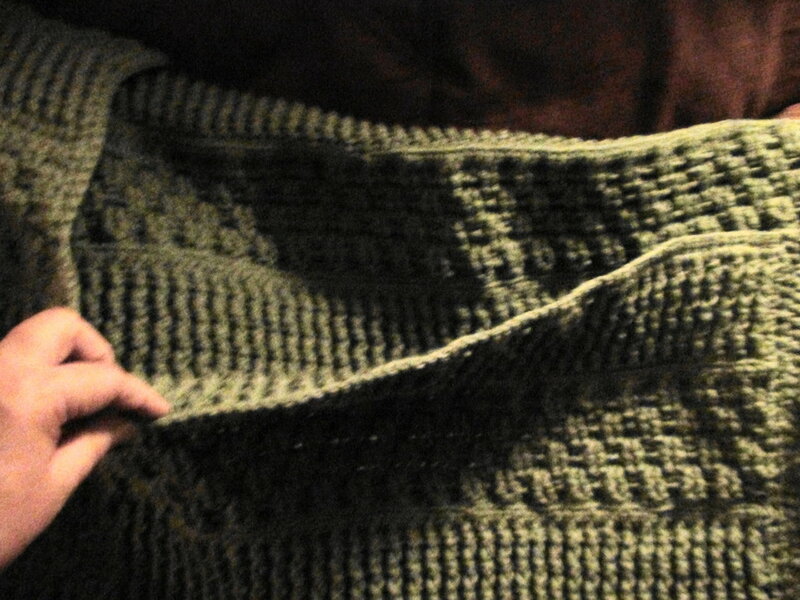 My mom called this evening and told me that dad really likes his afghan and is using it a lot. That makes me really happy. I hope she is using her shawl too. She hasn't said much about it since the first day she got. But I happy that they have them. I have more projects that I am working on and will be posting them as soon as I have them finished. My first baby set. 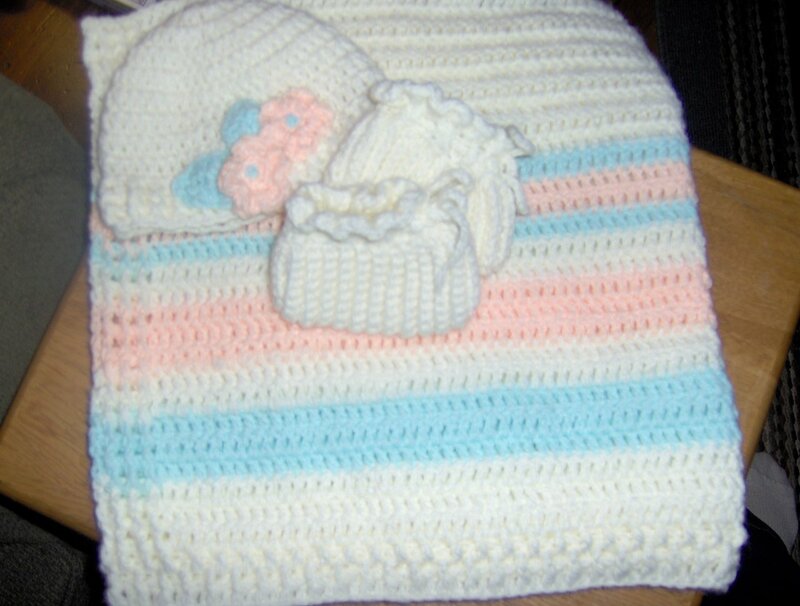 Afghan, booties and hat. Really enjoyed making this and look forward to making more. Changing the colors. Have a couple of new baby girls coming in the New Year! 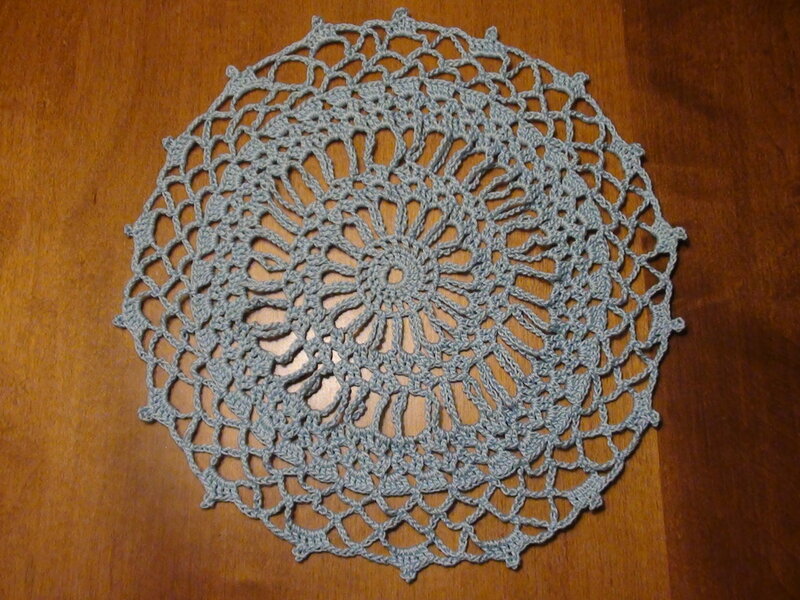 This is one of my favorite patterns to do for doilies. 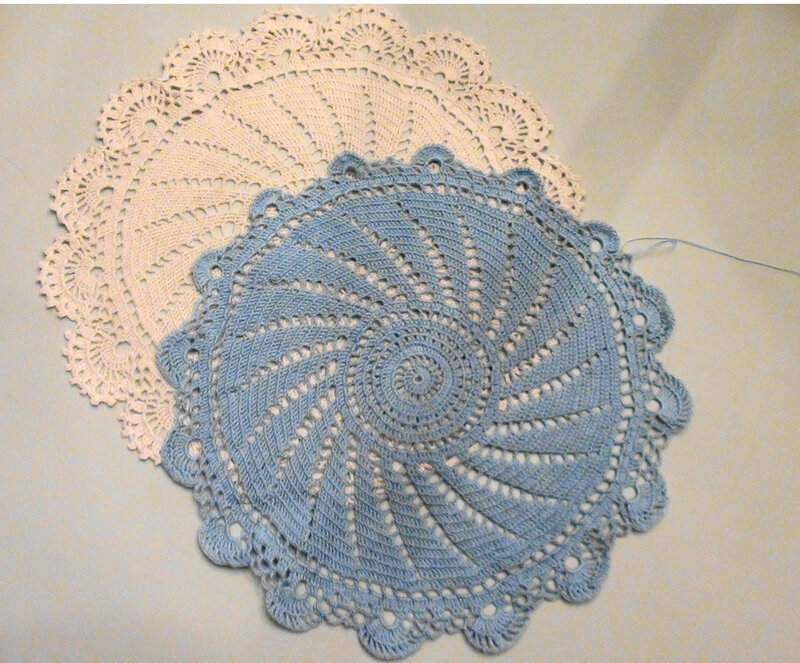 It's called the "Swirl" Doily. This particular one is for my son Billy's girlfriend. 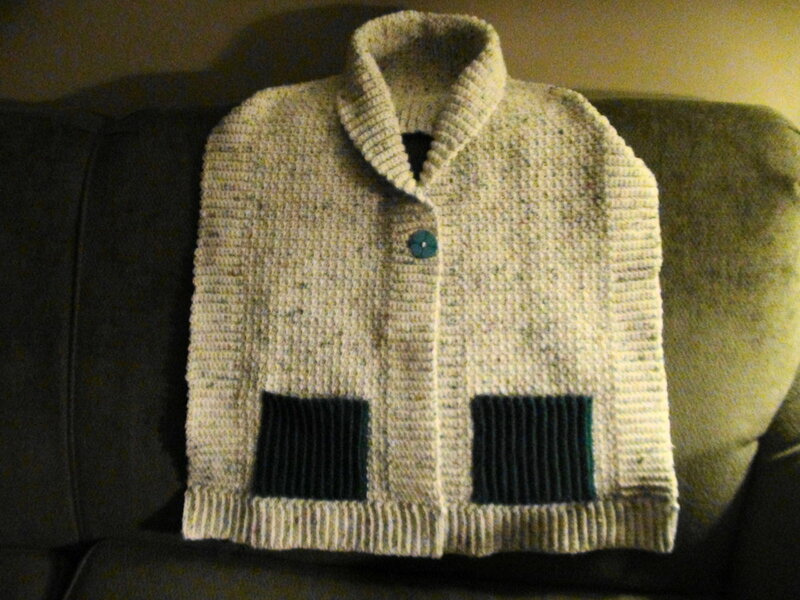 She liked the one that I did for myself and asked if she may have two, one blue and one in light green. Haven't finished the green one yet (almost done though). The picture below shows mine along with the blue one while I was working on it. These are pictures of the pie plate carrier that I made. Part of a set of carries that I make. 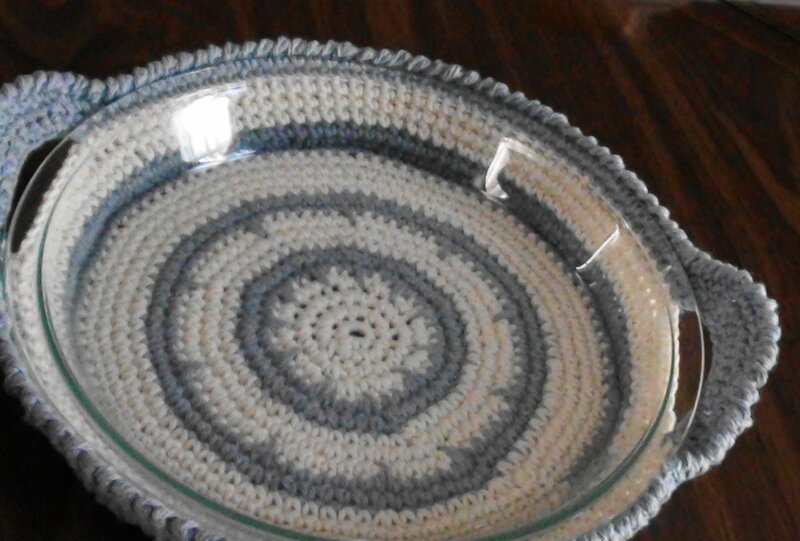 Carriers for pie plates, casserole bowls and oblong pans. 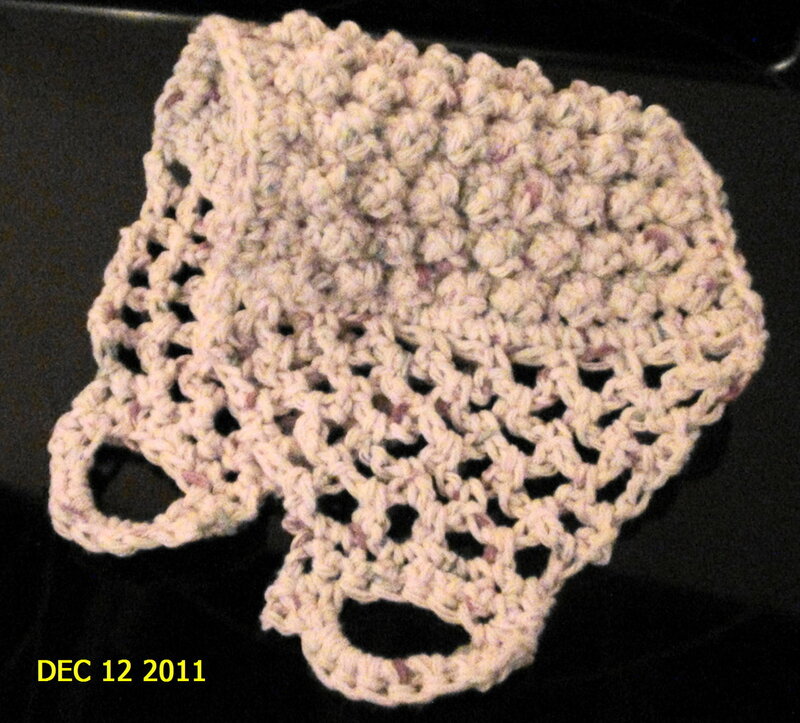 Below is a picture of another type of back scrubber as well as a bath puff and two wash cloths. 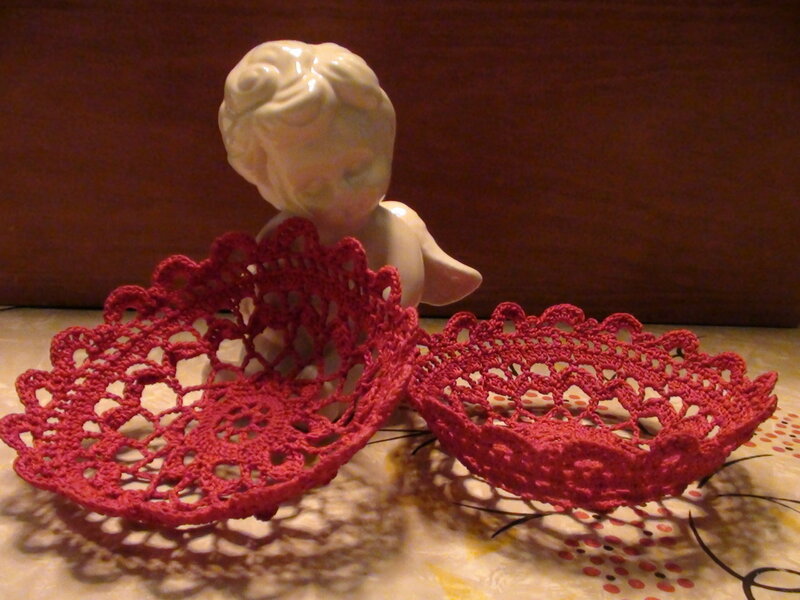 My Victorian Crocheted Thread Holder (reproduction of a pattern from 1904). 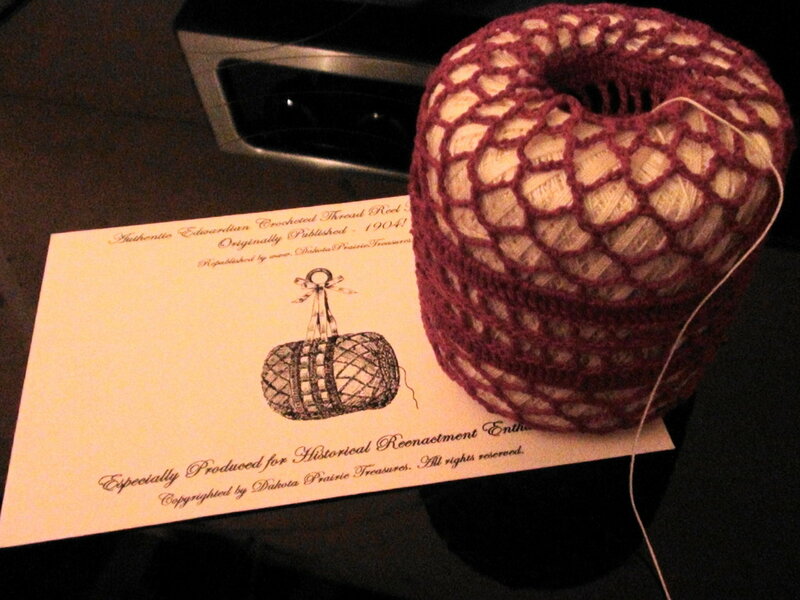 Still have to add the ribbons through the middle and attached to a ring so that it can be hung while using it. 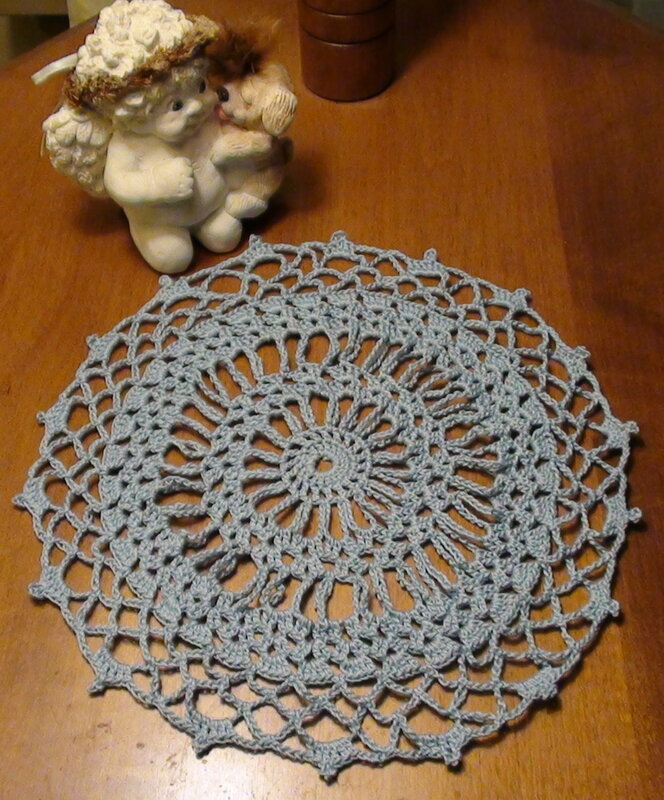 Five Hour Doily made while enjoying the company of my friends on the December 13th's Crochet A Long on Maggie's Crochet facebook page. We meet every other Tuesday from 7 - 11 est. We always have so much fun sharing patterns with each other. 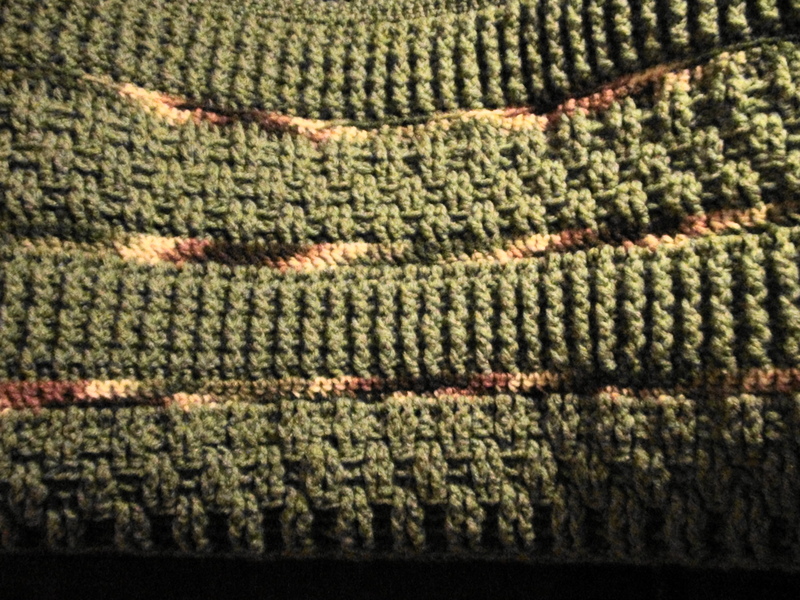 The picture on the left is of the Toe-Warmer Afghan that I made for my father for Christmas. 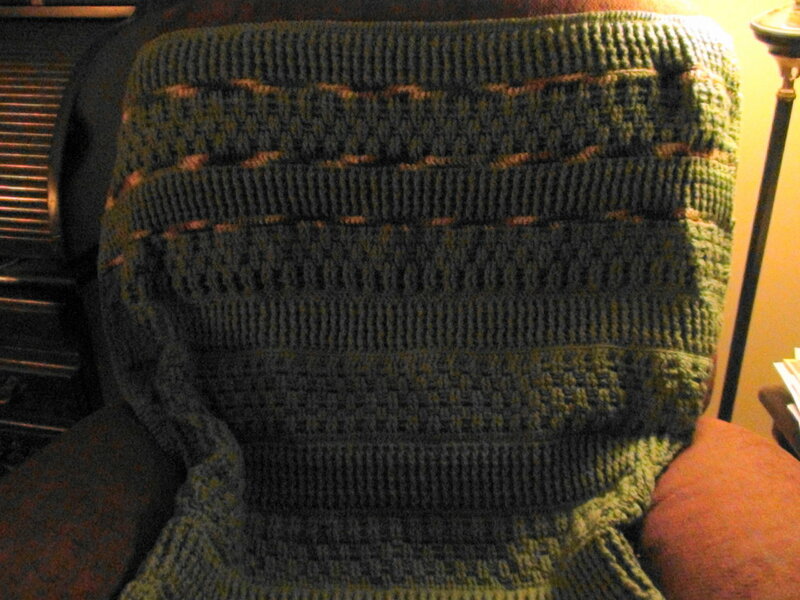 Picture on the right is Top part of the afghan close up. This is a Reading Shawl that I made for my mother for Christmas! Taking a breather from getting ready for the holidays here! My sons from MA and PA are coming home! Looking forward to seeing everyone together again! I have been busy crocheting away in my spare time! Including finishing a few Christmas gifts. I will post these in just a few minutes. Hope everyone has a very Merry Christmas and Happy New Year! May your homes be filled with lots of laughter and cheer. 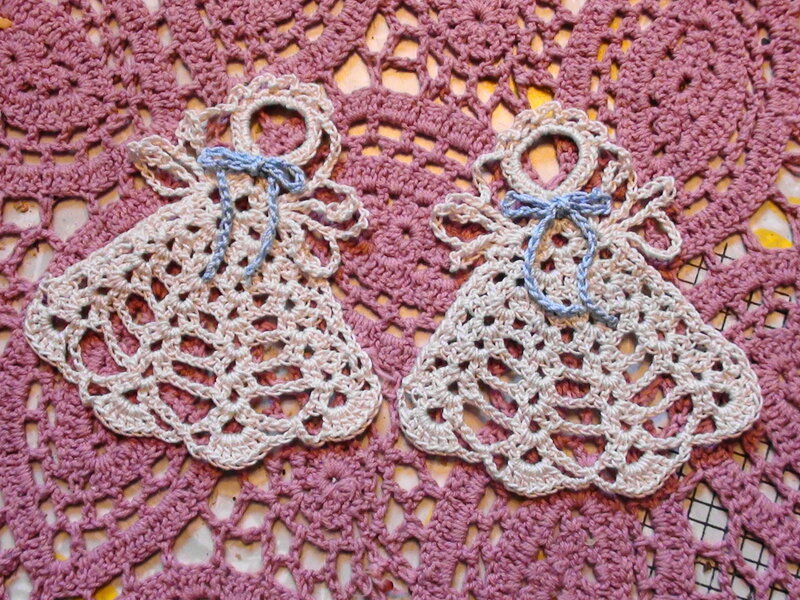 These are a few of my Christmas Angels that I have been working on today for the Christmas tree. I have not starched them yet but will be doing all of them tomorrow. Yah! 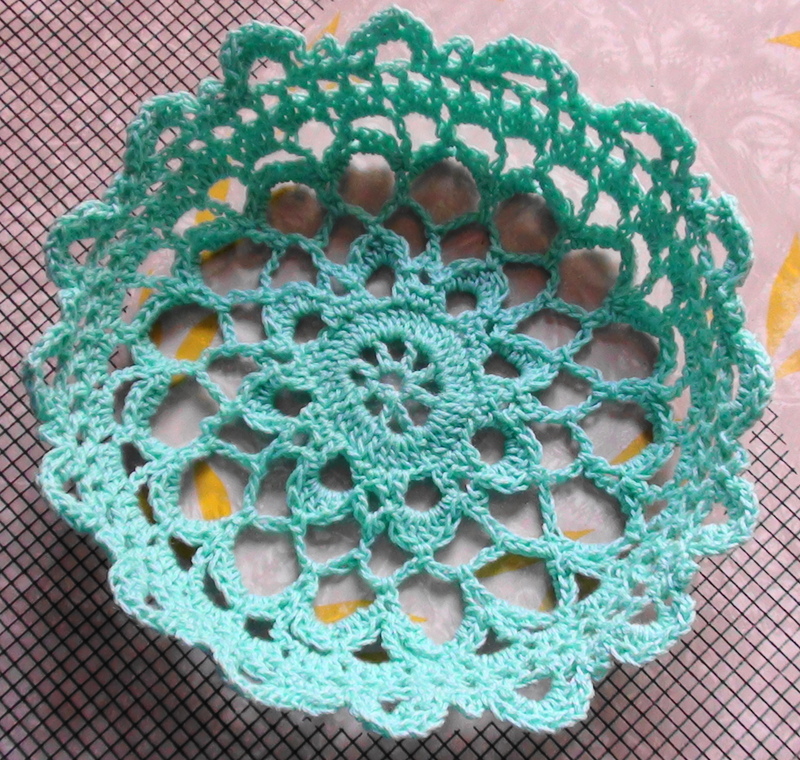 I would love to be a pattern tester for Glow's Crochet Creations! She has such beautiful patterns. 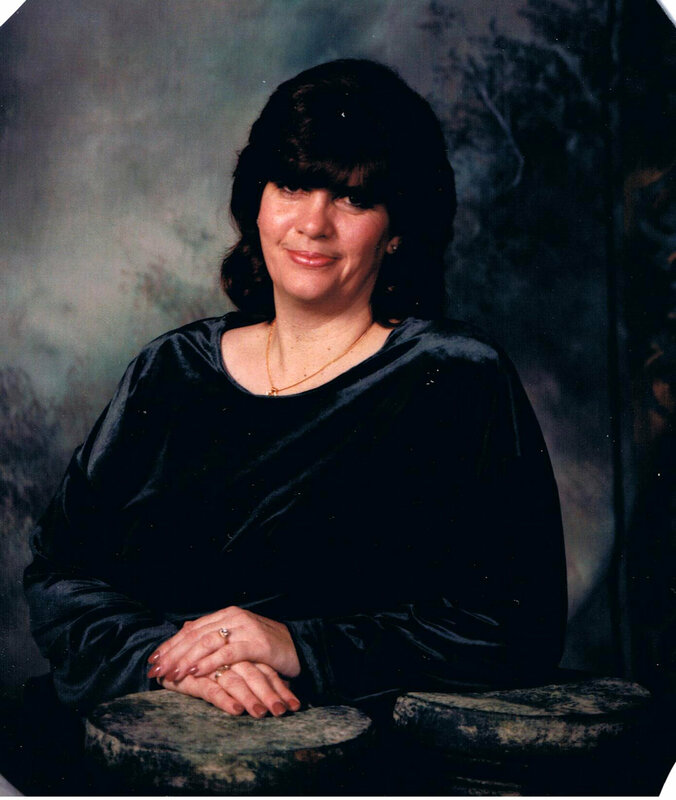 Please stop by and let her know that I sent you! Have been busy here with the second snow storm of the season coming on the eve of Thanksgiving. We got a foot of snow and it is the third time that we have had a white Thanksgiving since we have moved to Maine in 1997. 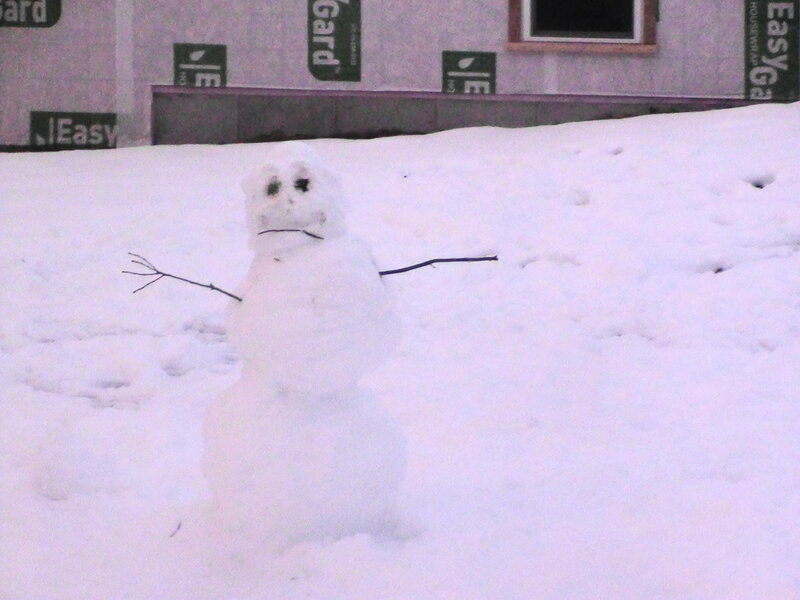 It was a beautiful Thanksgiving and the grandsons had a great time building the first snowman of the year! We shared our Thanksgiving dinner with my daughter and her two boys. But were missing my oldest and middle sons this year. Which was a first holiday for us here not to have all the family here. The family is growing and three oldest children have their families and friends now. I knew it would be coming just didn't say I would like it! Love having the whole family together when ever I can. Will be getting ready to put up the Christmas tree today! Looking forward to doing that a lot. Will be using my new ornaments (which I still am working on....will hang those that are not done and do them as I can). It will look so pretty this year! Working on various projects right now. Finishing up a couple of gifts that I have to get into the mail in the next couple of weeks. As well as working on those that I am doing for the family members here in Maine. I will post those items as they are finished. 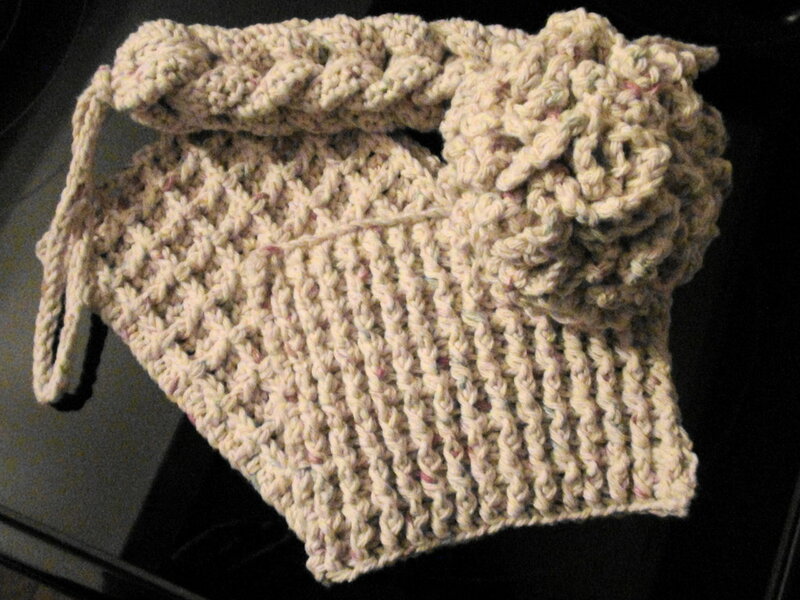 Also have joined a contest that ends in January for crocheters. Need to decide on doing a scarf or shawl, pillow or fingerless gloves. Looking so forward to doing this! New designs for my Christmas ornaments! There are four different styles here now and growing more each day! I have fun crocheting and this is my first time to really create my own designs and Christmas has always been one of my most favorite time of the year. So what better project to start out on my own. Will add another picture later as the others are finished. 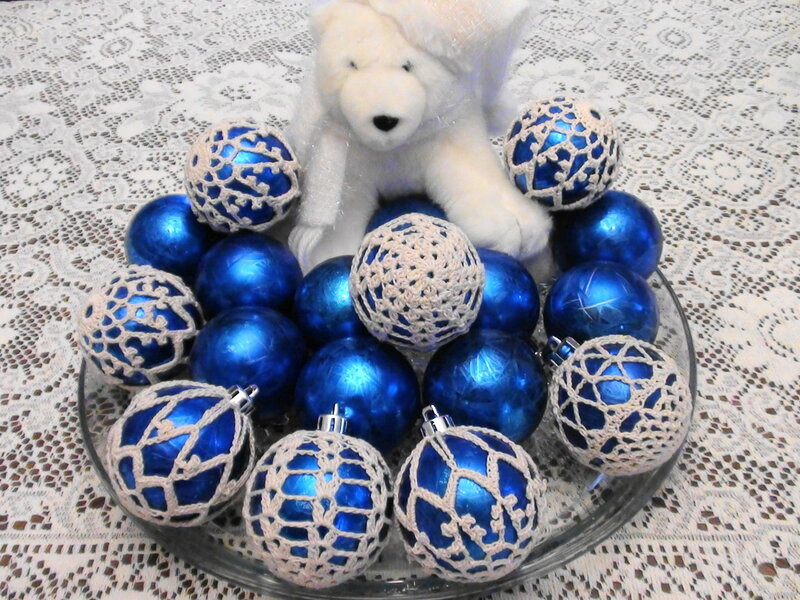 As well as, pictures of other ornaments that I have been working on (but they have to dry first!). Hope you have a great day and keep on crocheting with a smile! First Christmas project this year! This has been my project for today. 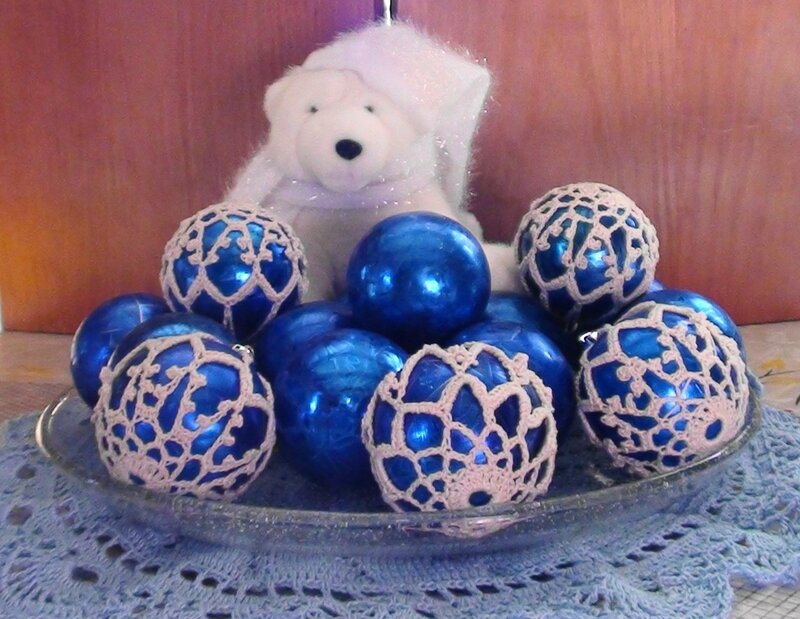 Covering my old Christmas ornaments. What a fun new way to make something old new again! 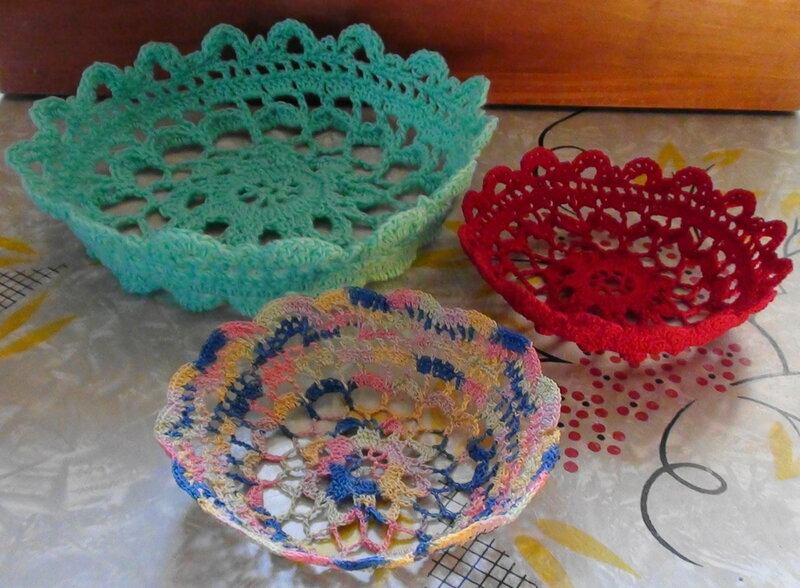 I created these bowls from the same pattern but I used #3 thread and G hook for the turquoise bowl and I used #5 hook for both of the smaller bowls. 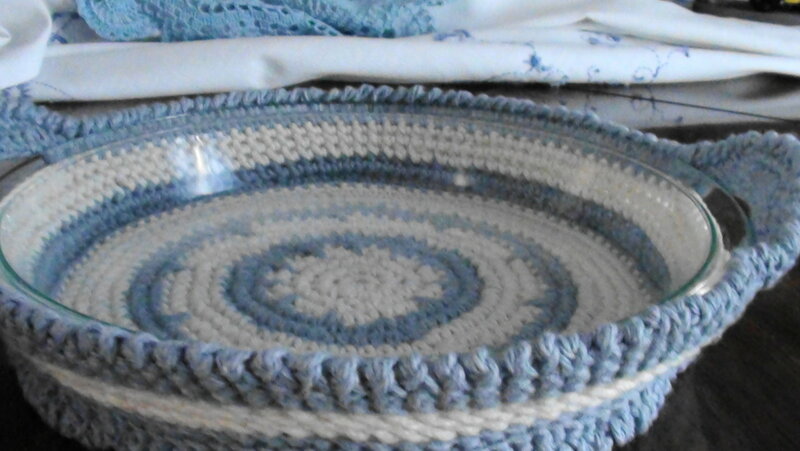 The red one is with #10 thread and the variegated bowl was with #30 thread. My name is Dani and I live in South Paris, Maine. 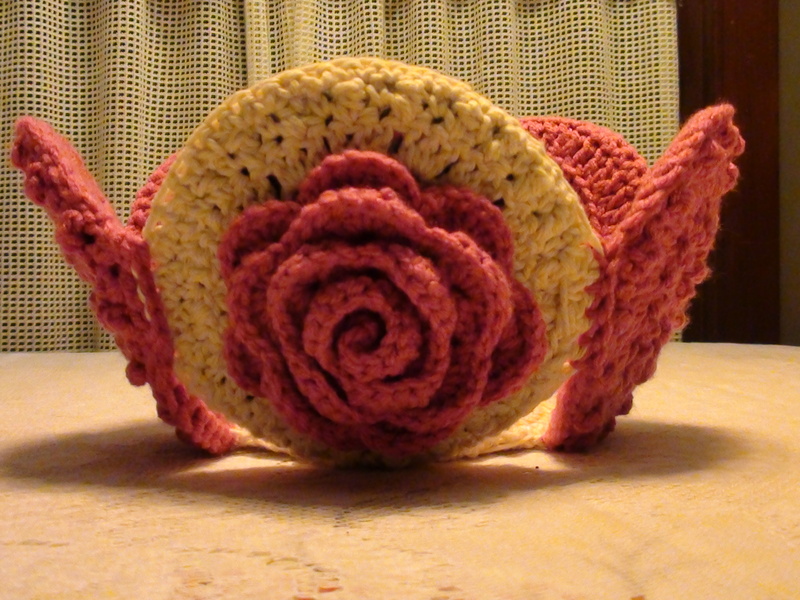 I enjoy crocheting and love to share with fellow crocheters. Would love to see what you may be working or sharing ideas. 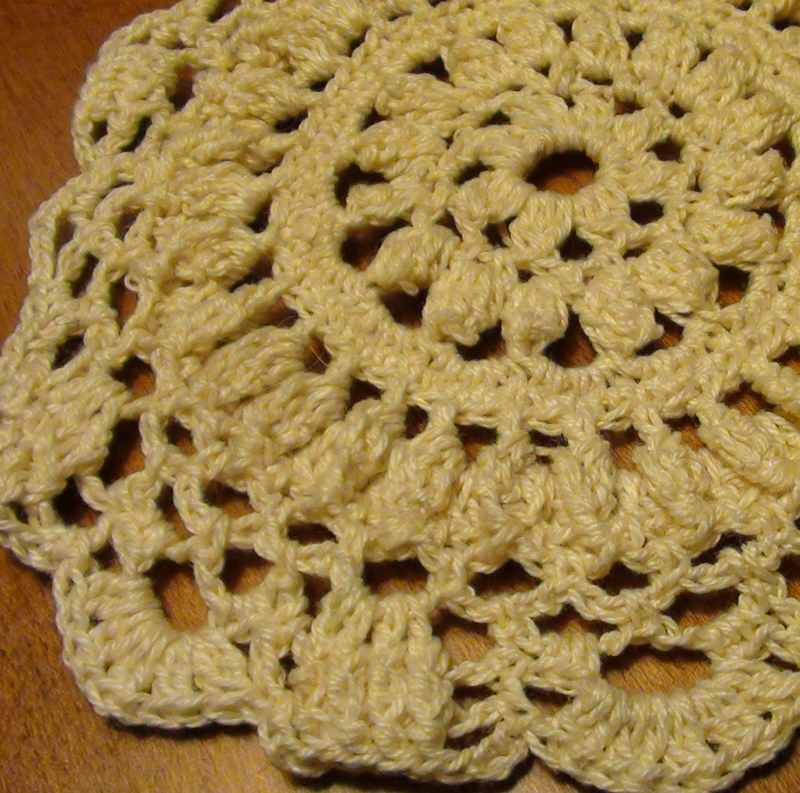 I crochet, tat, cro-tat, filet crochet. Also do counted cross stitching. I hope to hear from those crocheters out there.